As to when you shouldn’t prune your trees, that’s easy. You never want to prune your trees in the fall because during the fall season that is when a lot of mold and fungi spore. If there is an open wound on a tree because of a pruning, it can cause the tree to become infected with several species of fungus that can cause the tree to rot. You also don’t want to prune your trees constantly either. If you have pruned your trees recently, give at least two or three months before you prune them again, or you can injure your trees. You want to also prune your trees when it is a safety concern. For example, if you have an old eucalyptus tree in your yard, they’re lovely, but they also can drop branches. 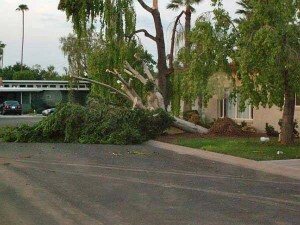 During the monsoon season as well as during the springtime, Arizona can have high winds. If you have a high tree, you want a professional tree care service to do any trimming to avoid potential safety concerns. When you are trimming flowering trees, there are a couple of rules to remember. For trees that bloom in early spring, you want to trim them after their flowers fade out. For trees that bloom in the summer, you want to prune them in the winter in the spring. Like regular trees, never prune your flowering trees in the fall. So remember, trim your trees carefully and at the right times. This will help you to avoid and trouble when you are trimming trees in Phoenix. This concludes part two of our series on tree care. Be sure to read part one as well.